George Clooney's Lake Como spread has played host to the best of the best. But this month the two-time Oscar winner's modern day Algonquin Round Table ("I was always enamored of that idea," he told The Hollywood Reporter of the set-ups. "All these really interesting, smart people, sitting around having conversations,") played host to perhaps its most famous pair. Just last weekend, the Duke and Duchess of Sussex—that would be Prince Harry and his new wife Meghan Markle—claimed one of Villa Oleandra's 25 rooms and a seat at George's famed table. Instead, they scored the coveted invite because the foursome are actually quite close. Like, hey, wanna borrow my private jet and spend the weekend at my waterfront Italian villa close. Even before the Catch-22 actor-producer, 57, dispatched his plane and an unmarked motorcade to ferry the royal pair (and their ever-present protection officers) to Italy Aug. 16, the quartet was regularly meeting up for dinners in London and bunking together at the Clooneys' $25 million Berkshire manse. "They all have a lot in common," an insider explains to E! News, "so it just clicked as a four." At first, the easy assumption was that Amal, 40, and Meghan, 37, were the connectors. Two well-heeled women with impressive pedigrees (Amal earned an undergraduate degree from Oxford before hopping across the pond for law school at New York University while Meghan double-majored in theater and international studies at Northwestern University, working as an intern at the U.S. Embassy in Argentina before committing herself to acting) and a passion for human rights who just happen to have their impossible perfect manes shorn by the same stylist? Sure, that checks out. But while the two women have become quite close in the past few years, it turns out they can thank their husbands for that bond, not their shared hair pro Miguel Martin Perez. Having floated through the same philanthropic circles for years (well before he and Amal created the Clooney Foundation For Justice, George co-founded Not On Our Watch in an attempt to curb the genocide in Sudan) the actor and the Sentebale co-founder, 33, connected at a private charity function in the UK, a palace source reveals to E! News: "They have been friends for more than two years." 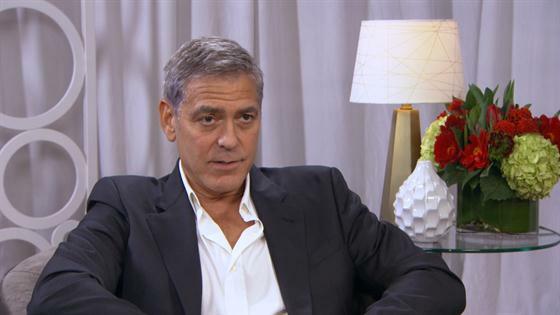 See George Clooney Choose Between His Famous Friends! So that would be right around the time the globe's most famous bachelor was introduced to a little-known TV actress. And as Harry and Meghan's summer romance went from blind date to adventures in Africa in a matter of weeks, the prince realized it was time to integrate the Suits star into his clan. While the world breathlessly awaited reports Meghan had lunched with Kate or sipped tea with Queen Elizabeth II, Harry was quietly arranging a get-together with some other bold-faced names. "When he started getting serious with Meghan, Harry introduced her to George and Amal," the palace source shares, "and the couple quickly started hanging out regularly." As anyone who's been on an awkward double date knows, the trickiest part of forming couple friendships is seeing if the unfamiliar spouses can get along as well as the original pals. So it had to be quite the relief for Harry and George to watch their better halves gel instantly. We'd imagine it wasn't hard for the two to find common ground after they'd cycled through the initial small talk. Both women, after all, had the unique experience of finding relative notoriety in their chosen fields only to skyrocket to the loftiest levels of fame not due to their professional accomplishments, but because of the more famous men on their arms. Or as Tina Fey deftly summed it up at the 2015 Golden Globes, "Amal is a human rights lawyer who worked on the Enron case, was an adviser to Kofi Annan regarding Syria, and was selected for a three-person U.N. commission. So tonight her husband is getting a lifetime-achievement award." It's a heady experience few would understand. But thanks to photographers capturing her very first official date with George back in 2013, Amal learned quickly that being out in the public space as a Hollywood celebrity rather than an internationally acclaimed human rights barrister would be tricky. "We definitely do more things in our home to ensure privacy in a context where we can't otherwise get it," she recently noted to Vogue. "But that whole side—invasions of privacy and paparazzi, all of that—has happened because of something so happy and so important in my life." Meghan's entree into the most glaring of spotlights was trickier, what with Harry having to defend his love from the nastiest of trolls who took umbrage with her nationality, her profession, her marital status and, sadly, even her race. But she also seemed to adopt an it is what it is attitude toward the attention. "It has its challenges, and it comes in waves—some days it can feel more challenging than others," she told Vanity Fair ahead of last year's proposal. "And right out of the gate it was surprising the way things changed. But I still have this support system all around me, and, of course, my boyfriend's support." "Amal has been helping Meghan settle into London life," an insider told People in the weeks following the nuptials. "It was a very natural friendship from day one." Natural enough that after a series of weekends at George and Amal's four-acre Sonning-on-Thames spread—located conveniently close to Harry and Meghan's Cotswolds rental—the Hollywood heavyweight and the Columbia Law School senior fellow issued an open invitation. Their royal highnesses should feel free to join them in Lake Como whenever they could jam a weekend away into their trying schedule of appearances and charitable planning meetings. That moment came last Thursday. Well-versed in dodging cameras himself, George arranged for his pals to make the 700-mile flight on his jet, then step straight from the tarmac into a set of waiting chauffeured sedans. Once safely ensconced in the outsized spread, which boasts tennis courts, a screening room, gym and even a pizza room, the quartet was able to relax. George and Harry played around with his collection of motorcycles and competed in a few basketball games, Good Morning America reports, before joining the ladies for dinners al fresco catered by some of George and Amal's local favorites, including nearby Il Gatto Nero. The women, meanwhile, were content to lounge near the villa's pool for much of the three-day stay as they fussed over George and Amal's 14-month-old twins Ella and Alexander and talked about any manner of topics. Because at this point the women have long since passed the we're friends simply because our husbands are friends stage. An insider reveals to E! News the pair have formed their own deep connection in the two years since Meghan started dating Harry: "Amal is like a confidante to Meghan." Their check-ins have only increased in frequency since Meghan uprooted her life in Toronto—where she filmed Suits—to join Harry at his Kensington Palace cottage. "It helps they're both UK-based now, but they have been able to relate on a lot about their lifestyles," explains the insider, "especially how to deal with being thrust into new situations in the public spotlight." In fact these days it's more likely that Amal and Meghan would be nudging their guys to set up a group date versus the other way around. "Amal and Meghan are much more friendly with each other and talk more regularly than George and Harry do," notes the insider. "They have become really close friends."